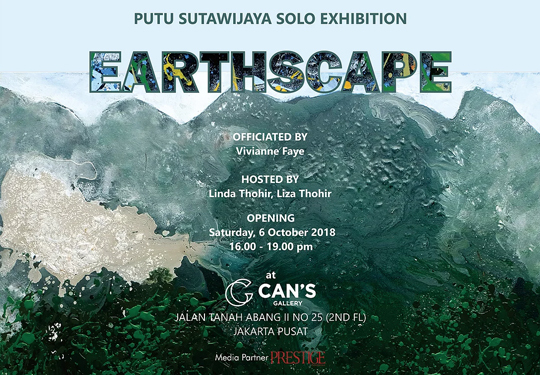 Earthscape exhibition is the presentation of the latest artworks by Putu Sutawijaya, a figure that have long hold fame in the Indonesian art scene. 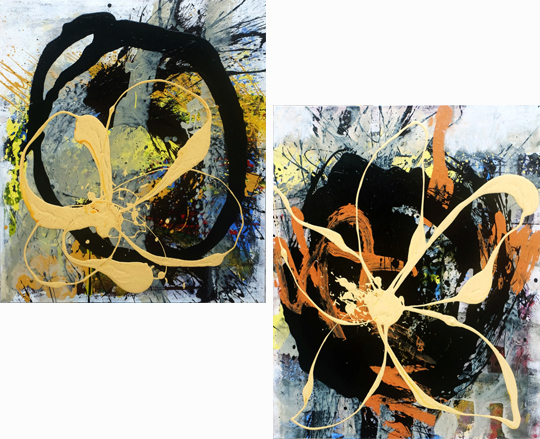 Can’s Gallery is proud for being able to present this series of artwork, showing his latest investigation in artistic vision and visual languages that differ from his previous works. For quite some times, Putu Sutawijaya is known through painting works depicting human bodies in gestures of flying or dancing, all with anonymous faces. After that period, he was then interested to trace back history through the appearances of ancient sites like temples or ancient inscriptions. The exploration also brought him to reconsider the relations between history and nature, and how the natural vista and landscape also changed along the transformation of human civilization. 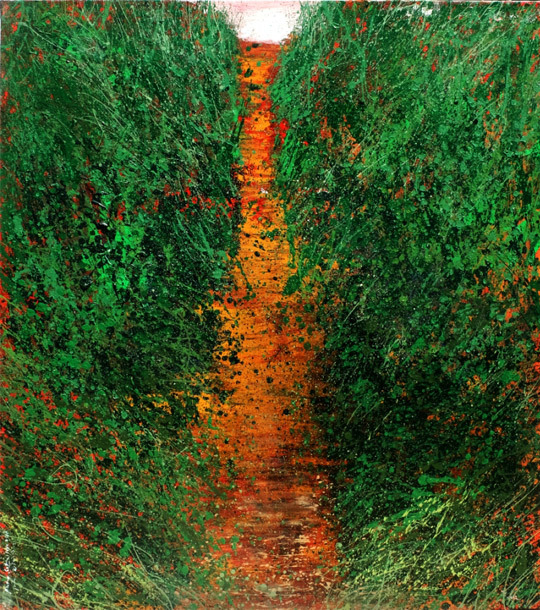 It seems that his exploration on natural landscape and life philosophies that emerged along in the contradiction between changes in time and the shifts of perception over the environment became the basic ideas of the works he exhibited this time. 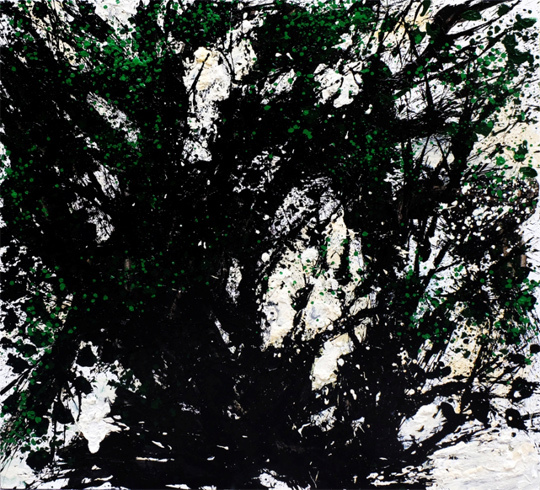 In accordance with the title, Earthscape, this time Putu’s paintings depict natural elements as the main visual language, with dominations of trees, branches, or even leaves. 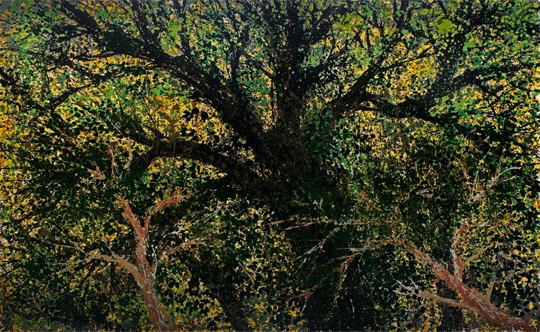 There is an interesting dimension of visual point of view when the classic shapes appear on Putu Sutawijaya’s canvases, where we, as the audience, are invited to ‘experience’ a relation to nature, instead of merely ‘looking at’ an image of tree or leaves. Eventually, the exhibition shows how an artist keep seeking new visual languages and visual approaches to convey their ideas and how they read the world. Putu Sutawijaya is an artist who has the gut to keep taking risks over the changes, instead it creates endless flow of creativities. Hopefully this exhibition inspires us all. Thank you to the artist who have worked hard to prepare for this exhibition with incredible results, and thank you for everyone who had always support us. A huge tree, a Saman (Albizia saman) tree at the north coast of Java Island, was the main target of Putu Sutawijaya’s trip two years ago. My own target was not (only) the tree, but the Bhre Lasem archeological site at the feet of Argopuro mountain. It was nearing dusk when we arrived at the hamlet where the tree has grown since the forgotten time. The azure on the west sky was nearly all swept away by the tangerine light. The silhouette of the great tree’s twigs and branches were rousing golden, within a swift moment they would turn somber. No longer he was able to spread his paper or span his canvas to paint. “One day we shall return here,” he said. One thing I never have expected was how he recorded the spectacular nuances in meticulous details in his mind. This incredible visual memory he showed to me a while after we returned to Yogyakarta. 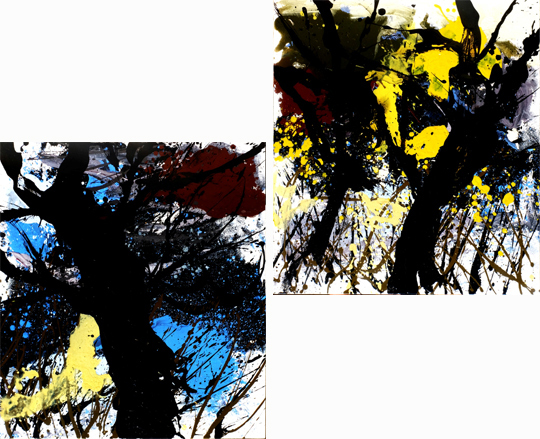 It was a silhouette painting of the rousing tree that I immediately recognized. I was smiling as I poured on the image, taken in awe, while he exploded in laughter. 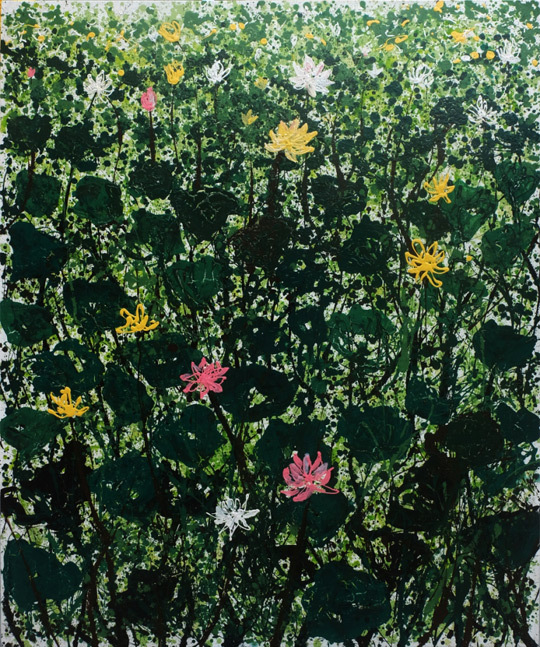 One time, not long after Putu left for Angseri, his home village, a scenic village in Tabanan, Bali, he showed me the paintings of fields of cosmos flowers and water lilies. 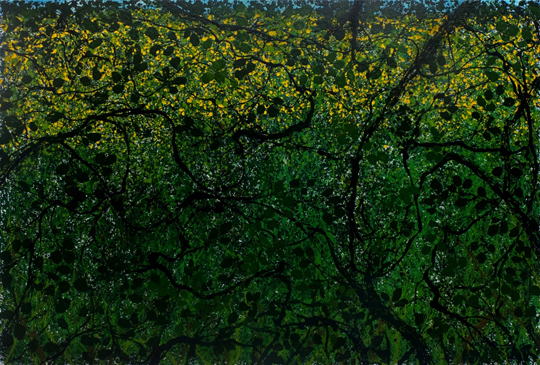 He had visually recorded those very particular memories of the trip to his birth village into huge canvases. Certainly, I was once again stunned by the unusual choice of subject-matter. Putu painting flowers was really something beyond my wildest imaginations. Fueled by curiosity, I would later throw at him a challenge of painting a single stem of flower. It seemed at the time he hesitated in responding to this challenge, a hesitation he defeeated by a landslide through the “Blossom” series. 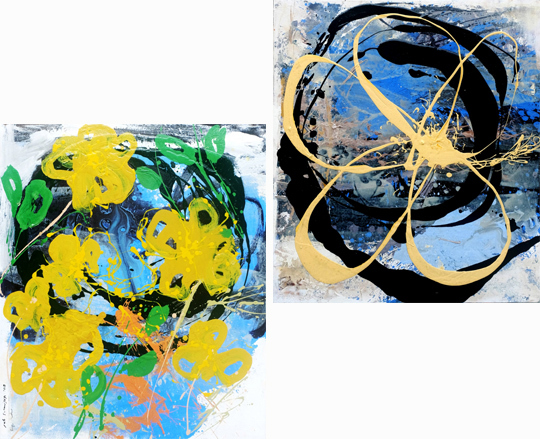 In the series Putu poured, not splashing, layers of thick paints (bold impasto) but in minimalism to construct the petals of plumeria and grass flowers. The last time he went back to Bali, he brought “souvenirs” of landscape paintings back to Yogyakarta. On the canvas is the stretch of Kursi Hills at the south of Pemuteran Temple, Buleleng, a panorama that even when parched during the driest dry season, remains breathtakingly beautiful. 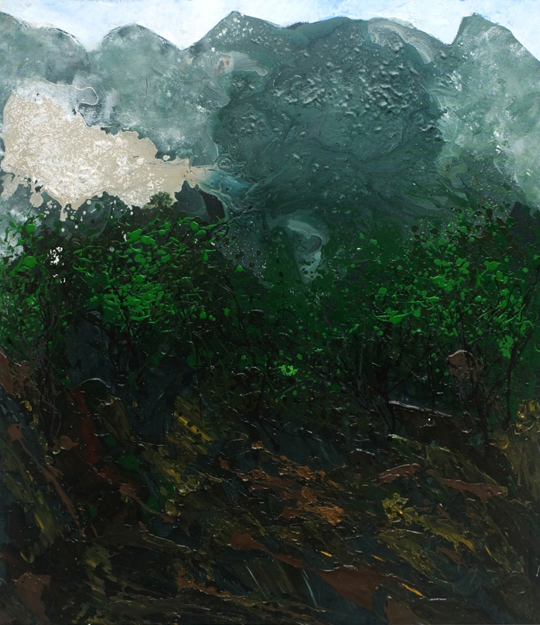 Afterwards, came a series of paintings created on the spot, the Wonosari, Gunung Kidul series: a recording of his trip across the Wonosary forests, the karst hills, and the big crushing waves in Gesing beach. 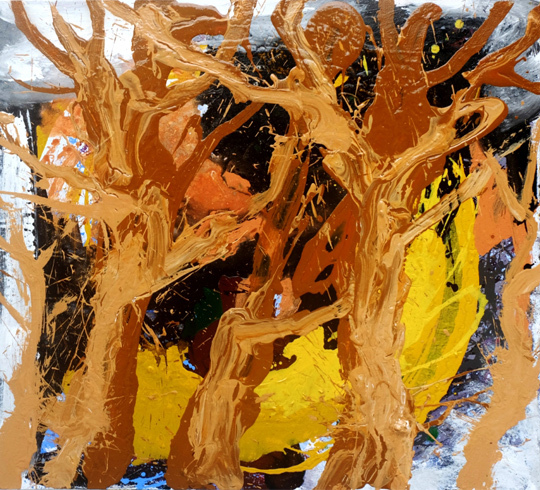 These paintings, in my eyes, are outspread like pastoral poetries, but not falling into the visual consumption mode, because Putu is able to absorbed all the visual exposures with a mode that could be said as sustained immersion. The memories that preserves the personal experiences into these eidetic imageries (“…directly felt and sensed,” Putu conveyed) are not only in details, it were also selected through the filters of interpretation. The result is what is called as earthscape, not in the meaning of the earth landscape from a height, but the landscape as it is observed from a close proximity, an experience-near. 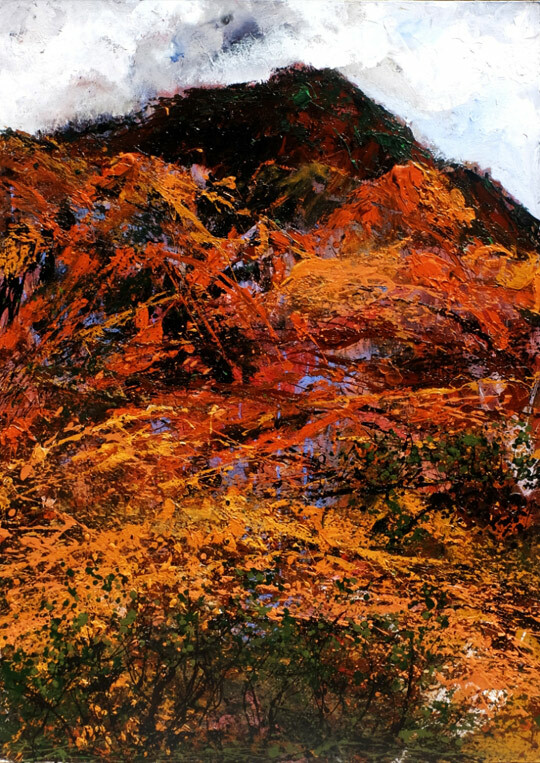 Although he had begun painting Merapi Mountain or the hills of Wonosari at least since 12 years ago (2006/2007) or even more, perhaps some of us still consider him as a painter of bodyscapes. When we observe his journey from bodyscape to earthscape, perhaps one can sense the one element that is now missing, the human body. 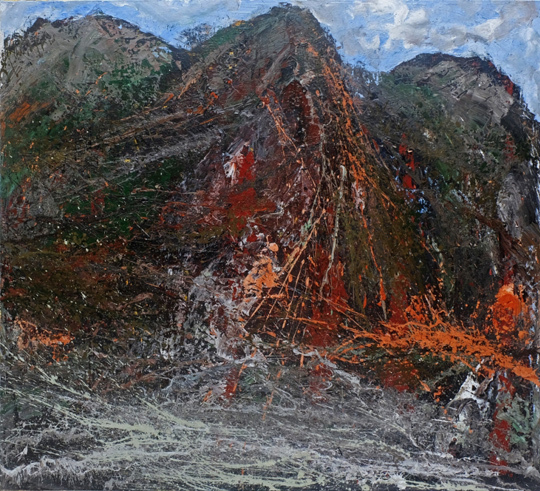 Where is the position of the human body in his series of earthscape painting? This question is not difficult to answer at all, the human bodies are an untold aspect of Putu’s paintings this time. Humans are still the agency of interpretation who are present beyond the frame, if we could borrow the phrase from Jacques Derrida. To conclude this mini essay, let me share another story. Our trips in the last few years, exploring and making pilgrimage to temples that are spread across Penanggungan Mountain, not only they triggered Putu to create a series of temple paintings such as of Gajah Temple, Kerajaan Temple, and so on, these paintings are records of the journey process itself. 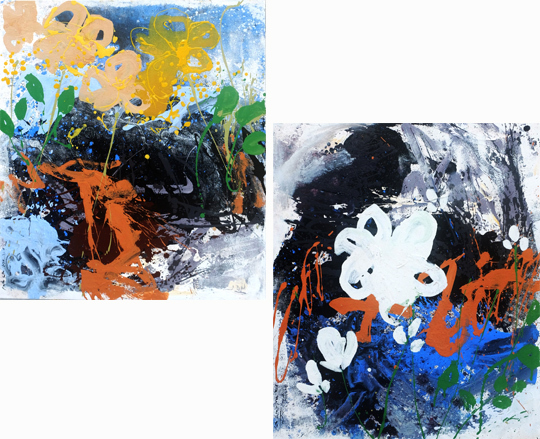 Two of his paintings that are also exhibited this time are examples that I never expected. “Jalan Sunyi” and “Semak Belukar” are metaphors for his pilgrimage trips. 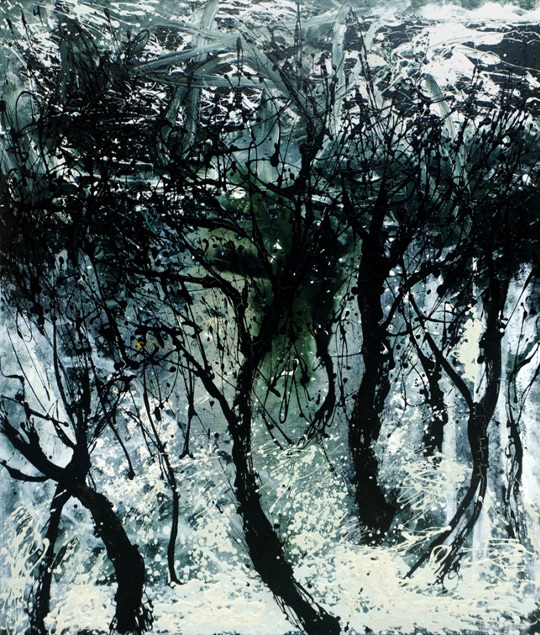 And when he eventually explained that “realities are not always realist”, this became one of the reflections of what he experienced in the midst of the natural and environment mightiness. Realities, without having had to become wearily stucked in a prolonged philosophical debate, we could for the time being understand it simply as “whatever we deem to exist”. Well, what we deem to exist is not necessarily realist. It could be fantastic, magical, or even all-resolving as The Ultimate Reality.